Sakai Guides and DocumentationSakai Basics Profile ToolHow do I set my notification and other profile preferences? On your preferences page you can control what emails are sent you when various actions occur, choose what widgets are shown on your profile, manage your preference to an officially provided image (if configured) as well as manage the Twitter integration for your status updates. All changes in preferences are optional. Note: Depending on institutional settings, some of these options may not be available in your local instance. Click the radio buttons to adjust the settings on or off for each email notification preference. If you have an existing Twitter account, you may link it to your Sakai profile if desired. Click Link Twitter account and a new window will open and connect to Twitter. Note: The Twitter integration will post your Sakai status updates to your Twitter account. However, it does not post your other Tweets to Sakai. 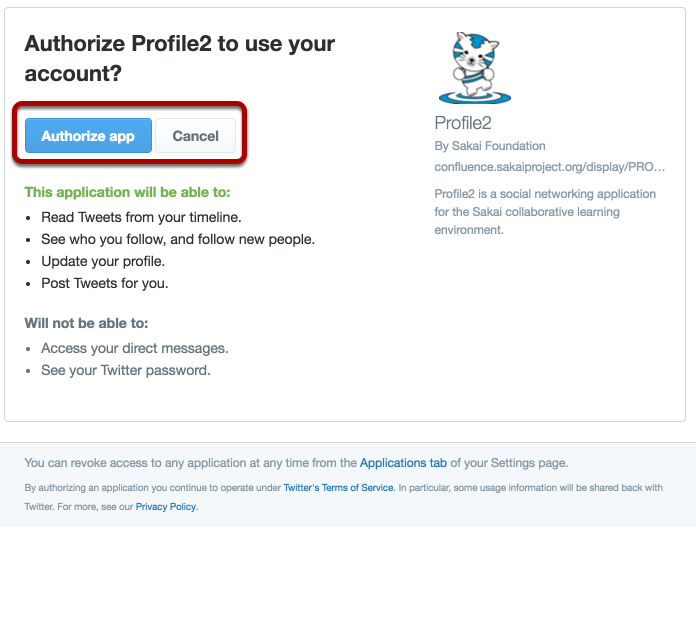 Log in with your Twitter username and password, and then click the Authorize app button to grant Profile2 access to post status updates. You'll be presented with a PIN code. Enter the PIN and click Link. Back on the preferences page, enter the PIN code in the box and click Link. Your details will be verified with Twitter. Note: You can disable the Twitter integration by clicking Unlink. If you have an existing gravatar and you would like to use that as your profile image, you may check the box here. Check the box next to any of the available widgets to show them on your profile. Show my kudos rating: This will display your kudos rating on your profile once it has been calculated. Show my pictures: This will display pictures from your image gallery on your profile if selected. Show my online status: This will show whether or not you are currently online. If enabled, you can further control this in your privacy settings. If disabled, you will appear to be offline. If you have made any changes to your preferences, be sure to click Save settings to save your changes. Prev: How do I change my privacy settings? Next: What is the Resources tool?